When I was my girl’s age, I learned how to ride two wheel bicycle by myself; many times of falling was the key. My friend let me ride her dad’s big bicycle that’s taller than me. I learned how to get on the bicycle but didn’t learn how to get down!! After enjoying that thrilling moment; I could ride a bicycle! !, I didn’t know how to get down from that big vehicle. I drove it to the grass area and fell with a crash. 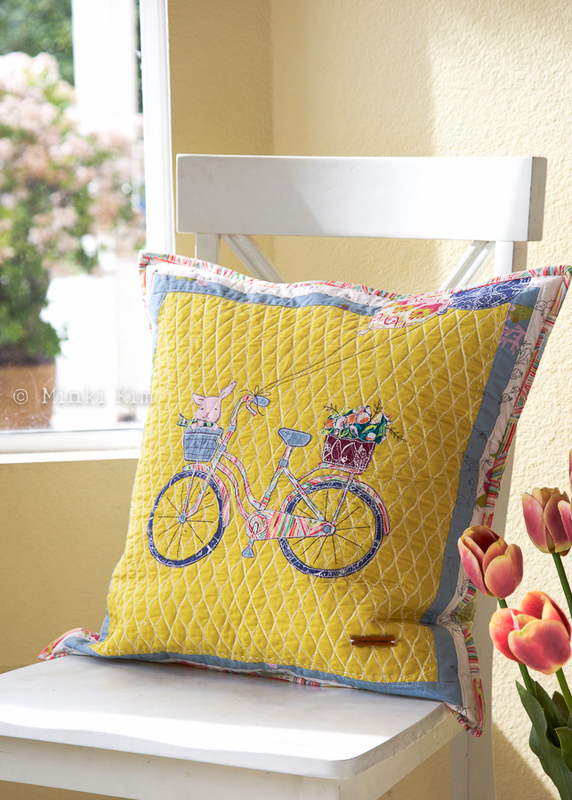 Not only because of that childhood memory, I have always enjoyed drawing bicycles. 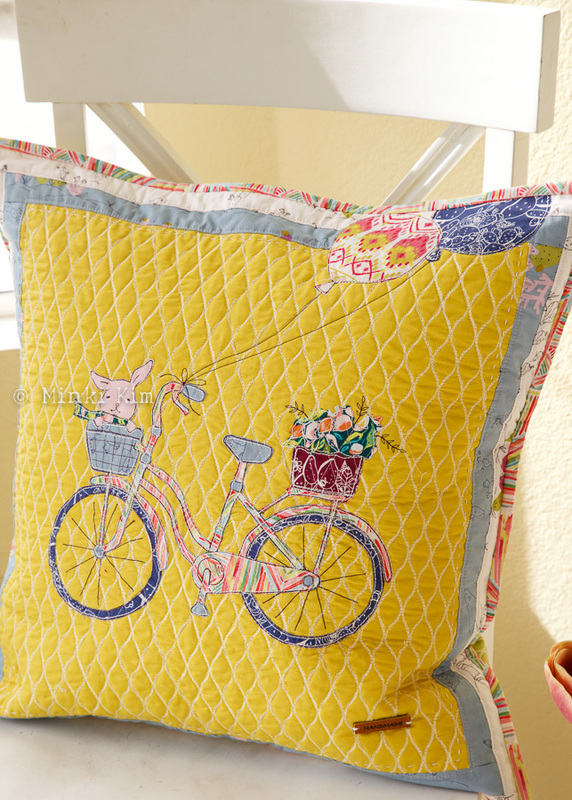 My very first sewing illustration Bicycle Hoop (2014) was featured in Somerset Sew magazine last year. 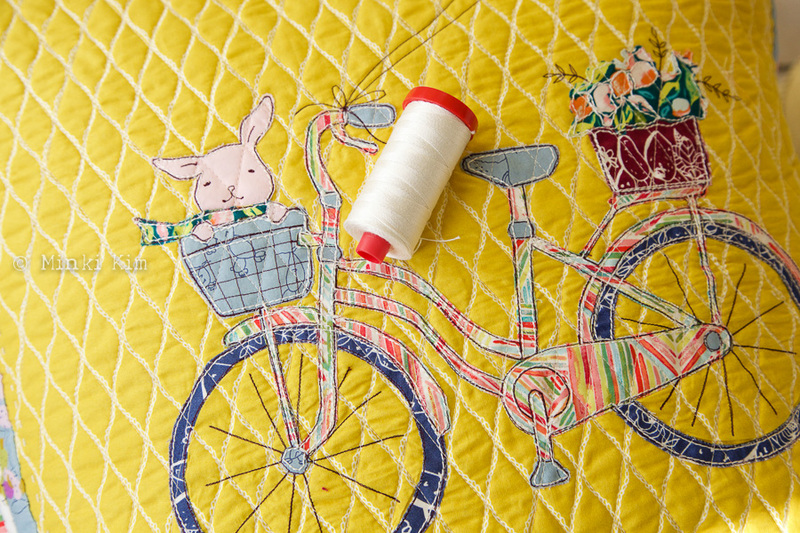 Then I have kept thinking of recreating my bicycle love on the fabric and it took almost three years. 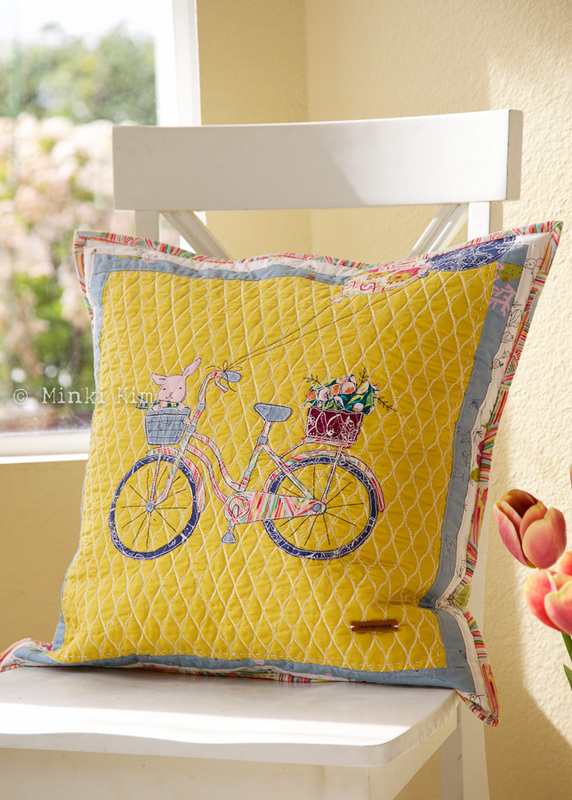 My Bicycle pillow pattern is available at my patternshop: Sewingillustration.com. First I sew outline using 50weight purple thread and then I outlined again using 12weight cream thread. I love the result and I will definitely use this method over and over again. *When I used 12 weight thread, I change needle no.90 and set the stitch length to 2.5-3.0 depends on the curves. 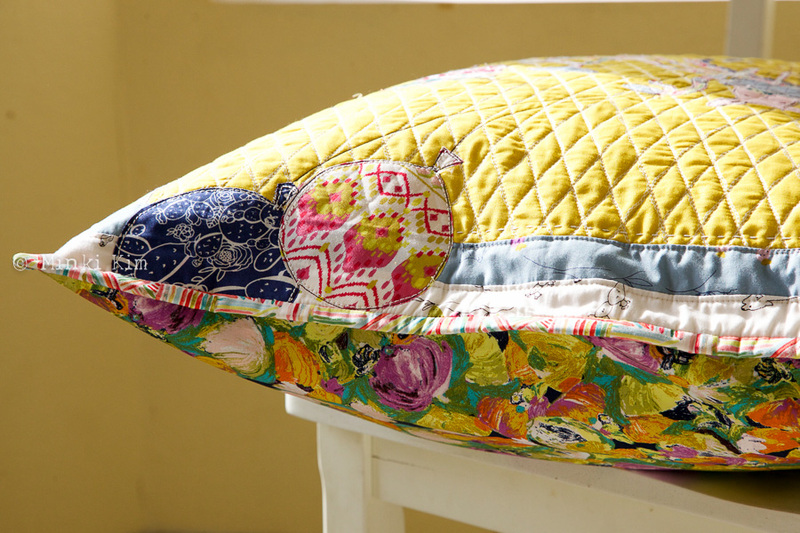 And I used Quilter Dream Cotton batting. 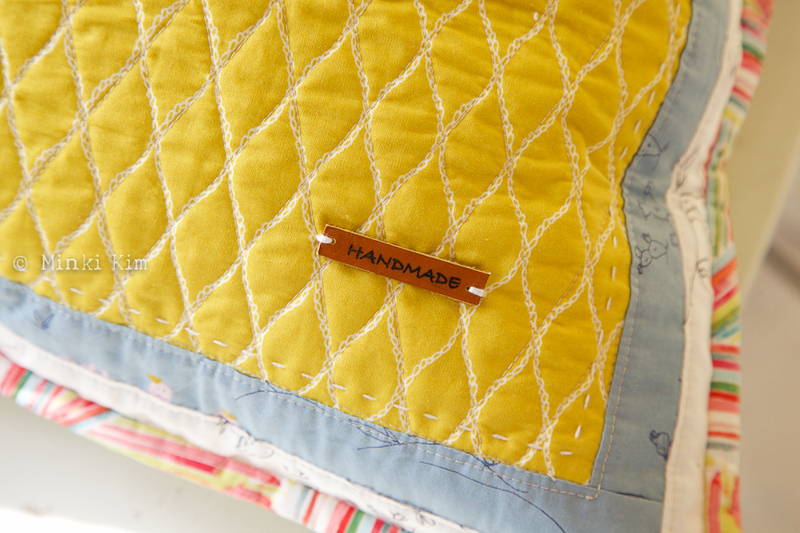 I had a chance to experience Quilters Dream at QuiltCon last year and they were in my wish list ever since. 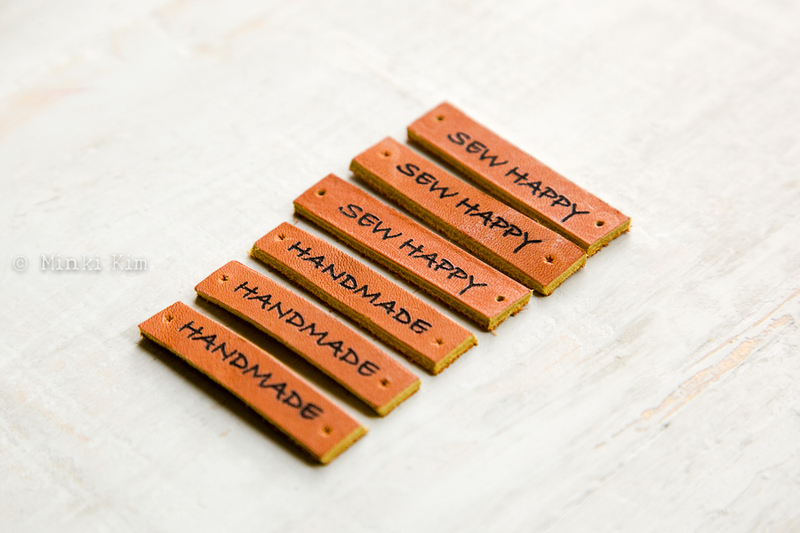 Oh how I love this handmade leather tag. Love the front and the back. I will enjoy the back side sometimes. 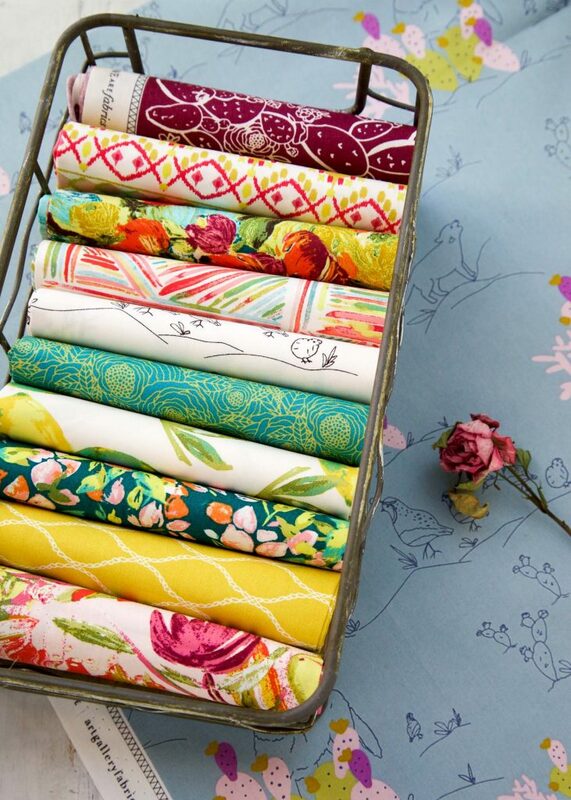 I was lucky enough to play with Bari J’s Sage collection for Art Gallery Fabrics. I have been admiring and wondering how her fabrics would like over the screen and they are all mine now! Order your Genuine Leather tags here. Such a lovely pillow! Great job. Love that it relates to a childhood memory. Your name reminds me of my old favorite song by Barry Manillow. Love your name!